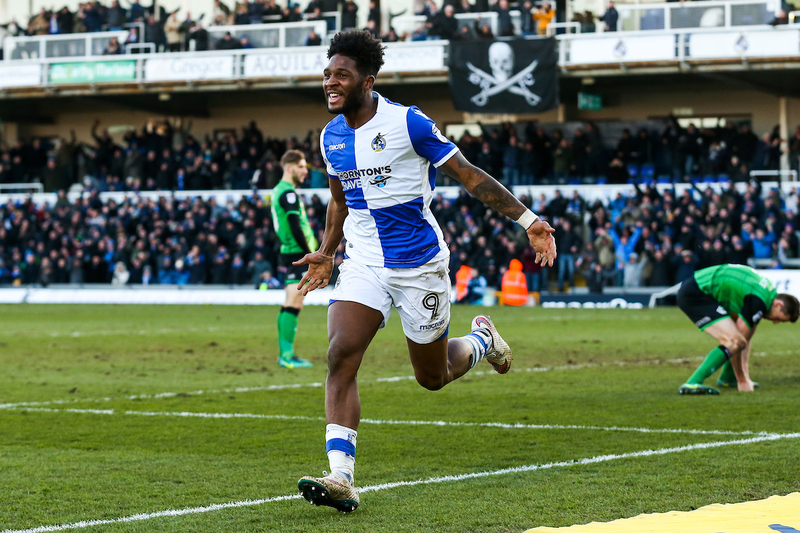 Ellis Harrison netted in stoppage time to salvage a deserved point as Rovers drew 1-1 with Scunthorpe United at the Mem. The pitch conditions made for a very scrappy game with neither side able to thread together many flowing moves. Rovers did have lion share of chances, most of which coming in the second half, Ellis Harrison, Rory Gaffney and Kyle Bennett with the best opportunities. United scored on the 60th minute despite doing more defending than attacking, as Duane Holmes squeezed the ball under the onrushing Adam Smith. The Iron had held strong all game and looked to be heading for victory, until Ellis Harrison turned home Liam Sercombe’s cross at the near post in the 91st minute. Darrell Clarke made two changes to the side that started at AFC Wimbledon last weekend, with Lee Brown and Rory Gaffney coming in for Marc Bola and Ollie Clarke. Sercombe had an early opportunity five minutes in to pounce on an error as a United defender sliced his clearance in the penalty area, but the midfielder’s touch was too heavy. Cameron Burgess got forward for the visitors to get on the end of a free-kick, but his header floated harmlessly over the bar. Despite a tepid opening 10 minutes, the front two of Harrison and Gaffney linked up well, with the former winning a good header into his strike partner who flicked round the corner for Kyle Bennett, with the winger cutting inside and bending an effort for the top corner but was just off the mark. The jagged pitch was making it difficult for either side to play decent football, but Rovers did craft a nice move down the left, with Chris Lines and Bennett linking up to feed the overlapping Lee Brown and the left-back found Gaffney with a neat cut back aided by a Harrison dummy, but Gaffney miskicked a great opportunity. On a couple of ocassions Rovers had been able to dig out useful crosses from either wings for Harrison and Gaffney, but the United defence did just enough in each instance to stifle their chances. Bennett was looking fairly lively down the left side, controlling a high ball well on 36 minutes before shifting inside on his right and fire a strike just wide of the post. Two minutes after the break and the game came closest to a goal so far, Funso Ojo hit a volley on the edge of the area from a corner which took several bobbles and deflections before bouncing off the bar. The surface continued to make play difficult, but there was promise down the right when Bennett released Gaffney whose cross just evaded Harrison. Bennett then also had a half chance of his own, taking the ball with his back to goal, turning and striking but his tame effort was collected by Matt Gilks. Rovers were enjoying a spell of possession in United’s half and were loading crosses in the box, one almost fell kindly to an unmarked Gaffney at the back post but the striker wasn’t quite set to have a shot. Clarke’s men were turning up the heat on Scunthorpe with the crowd ramping up the atmosphere too, even more so when Gilks clearly handled the ball deliberately outside the box and received a booking for his troubles. The Iron hardly had a sniff all game, but took the lead against the run of the play when Duane Holmes swept home (60) under Smith via a ricochet off the Gas keeper after being played in by Ojo. The normal Rovers pressure resumed following United’s goal and Bennett stung the palms of Gilks with a fierce effort from range, with 25 minutes remaining. Clarke looked to shake things up drastically, making a triple change that saw Byron Moore, Dom Telford and Bernard Mensah replace Stuart Sinclair, Gaffney and Bennett. 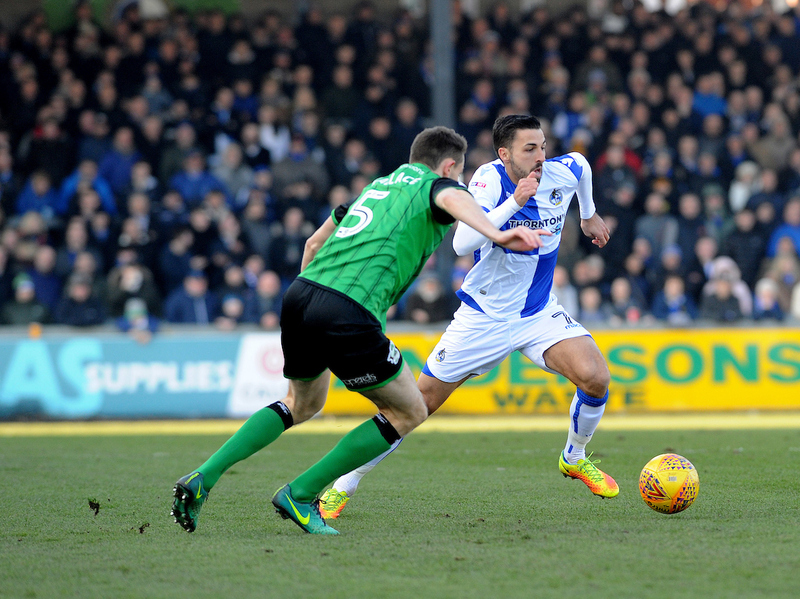 Smith’s services were still required in the Rovers defence, the keeper producing a decent stop to deny Tom Hopper. Confusion in the United defence saw Harrison almost loop a header from outside the box into an empty net, but for a Rory McArdle block which almost fell to Telford who would’ve had an open goal but the ball was scrambled away. With The Gas pushing forward in search of an equaliser, space was being left at the back for the Iron and on 81 minutes Smith produced an outstanding double save to deny Josh Morris. 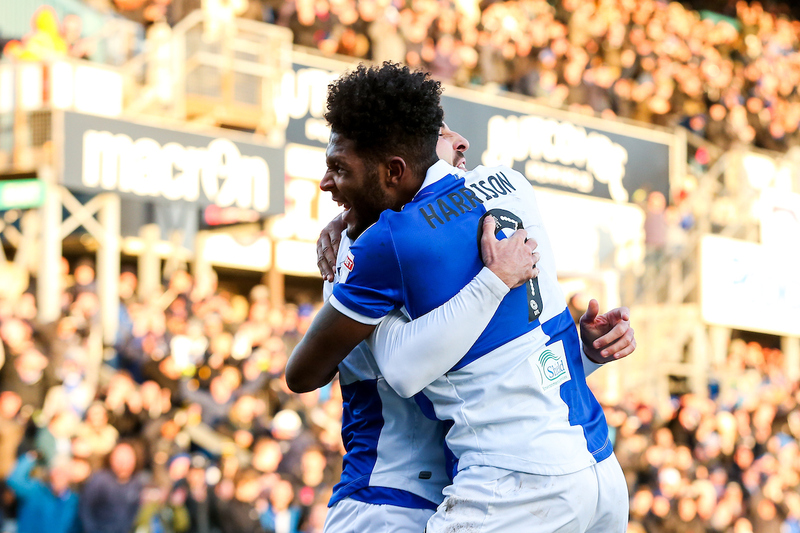 As the game entered the additional five minutes it looked like there may be no way back for Rovers, that was until Mensah and Joe Partington combined down the right and slid in Sercombe with the midfielder firing a cross across the near post for Harrison to turn home and consequently claim a share of the spoils. Unused subs: Sam Slocombe, Ryan Sweeney, Tom Nichols, James Clarke.